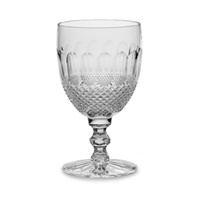 Waterford Colleen Encore Iced Beverage Glass The Colleen Encore Collection by Waterford is characterized by an ornate pattern of intersecting and broad vertical cuts, accentuating the brilliant clarity of fine crystal. The Stem of the Iced Beverage Glass has a beauiful design, which is different than the Colleen Collection. To preserve the clairty of your crystal we recommened handwashing. Handcrafted by Waterfords great craftsman.